Ten activities along with an introduction to using the Rekenrek or Number Rack. Includes correlations to the Common Core State Standards. For more resources including how to build your own student Number Racks for classroom use click here. 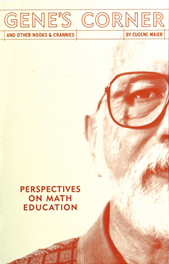 Gene Maier, MLC co-founder, combines a half-century of reflections on mathematics education in one book. In this collection of essays, Maier ponders his journey as a mathematics educator, looking at past and present issues in education, and examines current trends in schools. The essays in this book are also available individually. Read a book review from Teaching Children Mathematics, an NCTM publication. This book is designed for use in the pre-service and in-service education of elementary school teachers. Its goal is to improve the quality of math education that elementary school students are receiving. The book combines the author's interests in brain/mind science, computers-in-education, and math education. This book is an introduction to brain science specifically designed for pre-service and in-service K–12 teachers, for teachers of these teachers, and for parents. Its goal is to help you develop and understand answers around the questions of brain and cognitive science that fit your needs as an educator. This book is designed to help math tutors and students improve in their respective roles. The intended audiences for this book include volunteer and paid tutors, pre-service and in-service teachers, parents and other caregivers, students who help other students (peer tutors), and developers of tutorial software and other materials. This short book is designed to help pre-service and in-service teachers at both the elementary and secondary levels. Information Age Education published a series of newsletters on the Common Core State Standards. These ten articles have been integrated into book form and augmented by an Appendix, Goals of Education in the United States. This is a compendium that was first developed in 1988 and has been updated a number of times. All IAE Newsletters are available free on the IEA website. This book contains a series of Information Age Education Newsletters that explore various elements of the educational issues that will confront our society during the 21st century. The principal focus of the series is on the dramatic developments currently occurring in the cognitive neurosciences and computer technology. These promise to play an especially significant role in reshaping educational policy and practice. Designed for use in the pre-service and in-service education of elementary school teachers, this book provides an introduction to brain science and mind topics important to math teaching and learning. This book is written for people who are interested in helping children learn through games and learn about games. The intended audience includes teachers, parents and grandparents, and all others who want to learn more about how games can be effectively used in education. Special emphasis is given to roles of games in a formal school setting. Family members or teachers who take children to a Science and Technology Museum and want to recreate part of such an experience with their children in the classroom or at home. Pre-service teachers who want to learn about Web-based Science and Technology resources. This book was created for preservice and inservice teachers with the goal of improving the informal and formal math education of preK-8 students. The authors emphasize providing students with learning environments that help to increase their levels of math maturity. Visual Algebra for College Students presents a powerful way to look at algebraic ideas using concrete models and to connect those models to symbolic work. In this hands-on book each section is dedicated to a small set of related topics and presented as an Activity Set and a corresponding Homework Set. Each Activity Set starts with a description of the Purpose of the set, a list of the needed Materials for the set and an Introduction that gives definitions, examples and sometimes technology tips. Each Activity Set is a set of exploration based activities presented with space to write in exploratory work and solutions. These Activity Sets are entirely self-contained with graphing grids and other diagrams embedded into the workspaces. Each Homework Set gives a set of homework questions related to the Activity Set. The end of each chapter includes an itemized and referenced list of vocabulary and review topics for that chapter and a chapter practice exam. The “back of the book” material for Visual Algebra for College Students contains selected answers to Activity Set activities and complete solutions to each end of chapter practice exam.